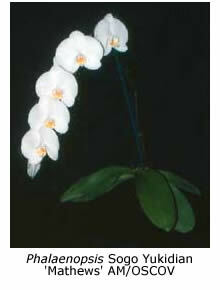 Most members probably grow a few phalaenopsis or other warm-growing orchid indoors, with mixed success. It can be done very successfully if you can achieve the correct balance of light, warmth and humidity, although this is easier written than accomplished. My wife and I have grown two phalaenopsis plants in our bathroom for the last five years or so and have flowered them every year, although three or four flowers on an inflorescence represents a good year!! Virtually every book or article on growing orchids indoors recommends placing the pots on a gravel-filled tray of water to help maintain an acceptable level of humidity, and for years our two phallies stood on large river pebbles sitting in trays of water. I wonder how many other members have used the same system? It transpires that this procedure is a waste of time and effort! 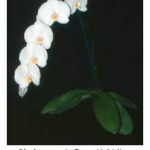 In the American Orchid Society Bulletin for 1994 (pp. 916-917), Douglas Kohl describes a series of experiments in which he measured the relative humidity (RH) at various distances above trays of water in his house in Minnesota (USA) at different times of the year. In summer the increase in RH was 7% if measured 40 mm above the water level, only 1% at 110 mm above the water level and zero at a height of 300 mm! The corresponding figures for winter (when the RH is very low in Minnesota because of low ambient temperatures) were 3%, 2% and zero!! Addition of pebbles to the water, as expected, had no effect on the results. It’s therefore obvious that growing plants above trays of water will have a negligible effect on the relative humidity at foliage level in the case of large plants like phallies, and only a slight effect for miniature orchids. Kohl also conducted experiments using water in transparent chambers, such as aquariums. In this case there were quite large increases in RH, depending upon the extent to which the top of the aquarium was covered. Of course, the RH reaches 100% if the tank is totally covered but the humidity regulates itself to about 52% RH if 30% of the top area is left uncovered, and to 72% RH if only 10% is left uncovered. It would therefore seem to be a good idea to grow your phallies in a partly covered fish tank containing a little water (sit the pot on a layer of pebbles, not in the water). Of course, dealing with a metre-long inflorescence may present some problems unless you have a very tall fish tank! Maybe it would be OK to let the flower spike grow through the opening in the lid – the lower humidity in the open air may be beneficial in reducing the possibility of flower spotting caused by fungal attack. I would try growing our phallies this way myself, if only my wife would allow me to keep an aquarium in the bathtub!